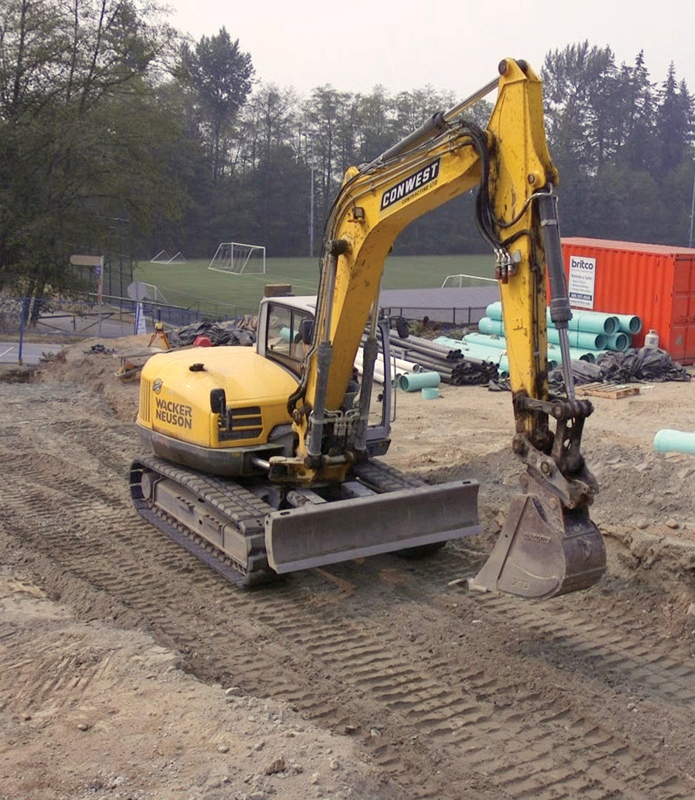 When Steve Claydon, equipment manager for Conwest Contracting in Vancouver, BC was presented with a challenging jobsite, he knew they would need particular equipment for the job. There were two parts to the terrain; extremely hard ground, with multiple services on top of each other, creating a lot of conflict on certain sanitary lines, storm lines, and other services. “On this job, we carry our Wacker ET145 for the really intricate parts of the job such as hard-to-get-in areas,” Claydon said. “We were able to put the machine in tight quarters, flip the bucket around, use it as a shovel, use it as a regular excavator. With the articulating boom, we can really shove that machine into tight quarters, and still pull the material out,” he continued. “The thing that caught our eye most about this machine, was the size of the excavator, with the option of the articulating boom and the overall balance of the machine,” Claydon explained. “If I put an operator on the ET145 for a week’s period of time, at the end of that week he really likes the machine for its capabilities,” he said. “Currently we’re sitting at eight dumpers, ranging from 3001, all the way up to a DW90,” Claydon said. “These dumpers are unique — we use them in all aspects of our jobs. We’ll actually bring the 3001 right inside buildings, putting scrubbers on it to reduce the emissions. We were able to get material in and out of some of our large commercial buildings during seismic upgrades and service upgrades,” he continued. Conwest also uses the 3001 to service trenches and remove material. 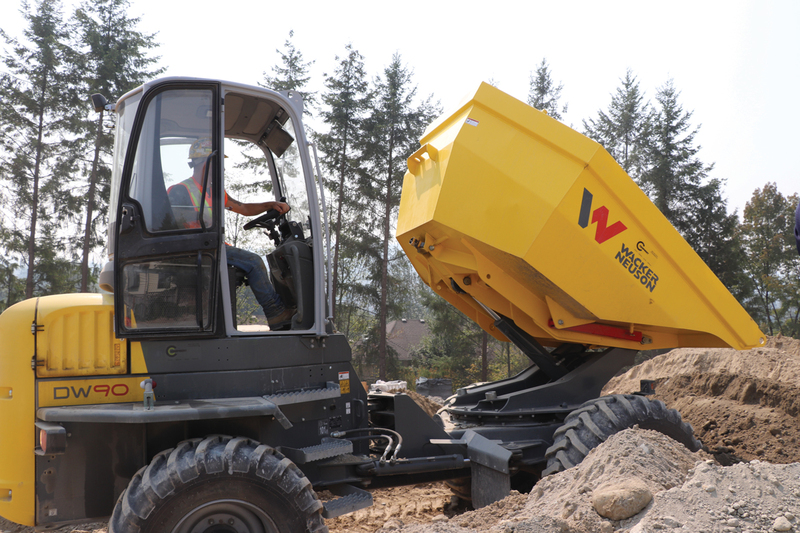 Conwest uses the larger dumpers for bulk excavations. “We’ll actually drop them right inside the hole,” Claydon explained. “We use them for our mechanical detail excavation, to move material from one side of the job to the next,” he said. “The DW90 helps us in a few of ways,” Claydon continued. “We don’t have to drop in a rock truck. When we’re cramped for size, we don’t have to utilize an on-site dump truck,” he said. “It also helps us with labour,” Claydon explained. “We can double-end our operators on our Wacker buggies; by moving equipment around, we can utilize operators a little bit more,” he finished. “The larger dumper aids trench backfill,” Claydon said. “We can move material in tight spaces and generate our own ramps — if you dump enough material correctly with the dumpers, you can basically build your own road to get yourself in and out,” he explained. “They save us time, time equals money,” Claydon continued. “The crews fight over them — originally everybody fought over the 3001, and now as we’re getting bigger, everybody just fights over the bigger machines,” he laughed. “They’re a very crucial part of our day-to-day operations,” he concluded. 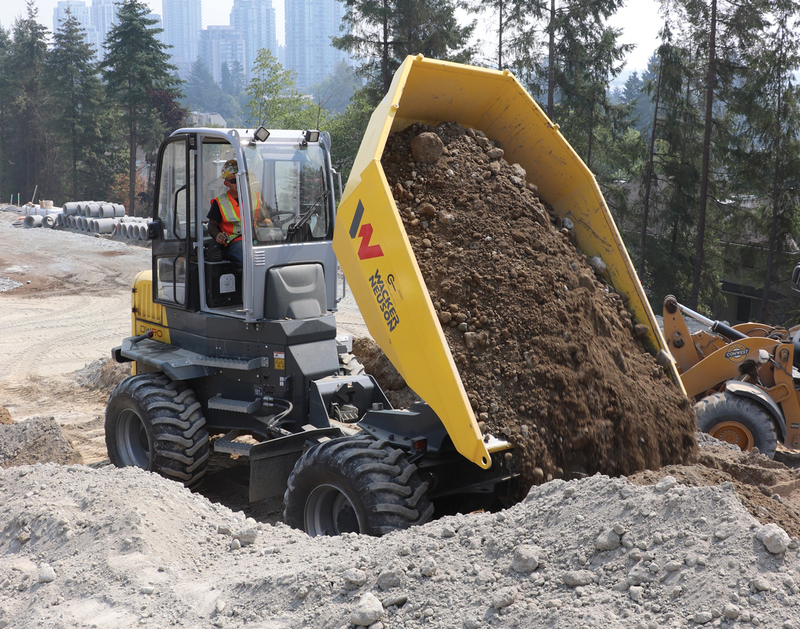 Conwest purchased their Wacker Neuson products from CC Equipment, Surrey, BC.